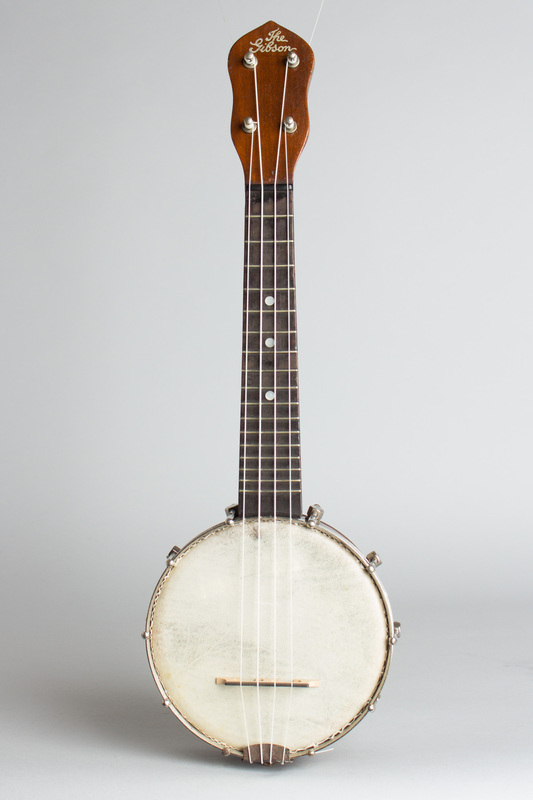 Gibson UB-1 Model Banjo Ukulele, c. 1928, made in Kalamazoo, Michigan, shaded maple finish, maple neck and rim, ebonized fingerboard, black chipboard case. This model is one of our perennial favorites! Although the diminutive UB-1 (retailing originally at $10.00!) 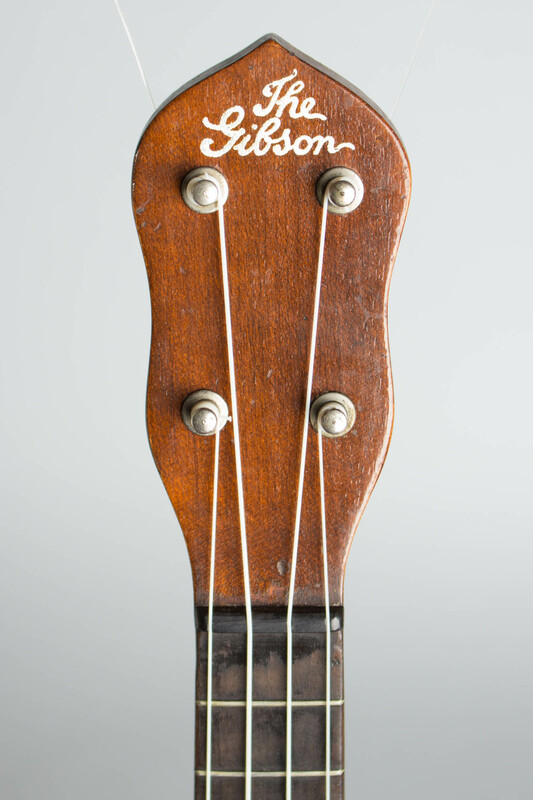 was the least expensive instrument Gibson ever offered, these are still very well-made and have a unique tone all to themselves�rather like the sound is already coming off of a 78 RPM disc! The UB-1 is perfect for bringing closet flappers out of the woodwork. Fun, extremely playable, and awful darn cute. Overall length is 19 3/4 in. (50.2 cm. ), 6 in. (15.2 cm.) 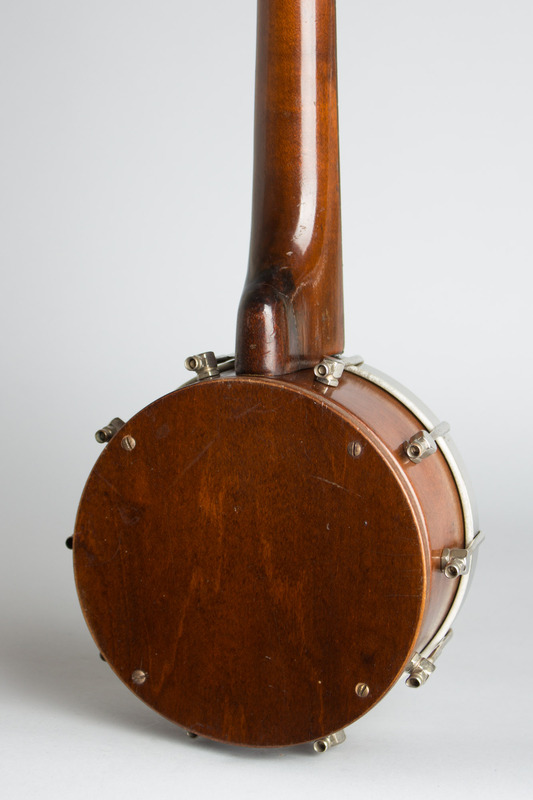 diameter head, and 3 in. (7.6 cm.) in depth, measured at side of rim. Scale length is 12 1/2 in. (318 mm.). Width of nut is 1 1/4 in. (32 mm.). This little UB has seen some use but plays and sounds very well. 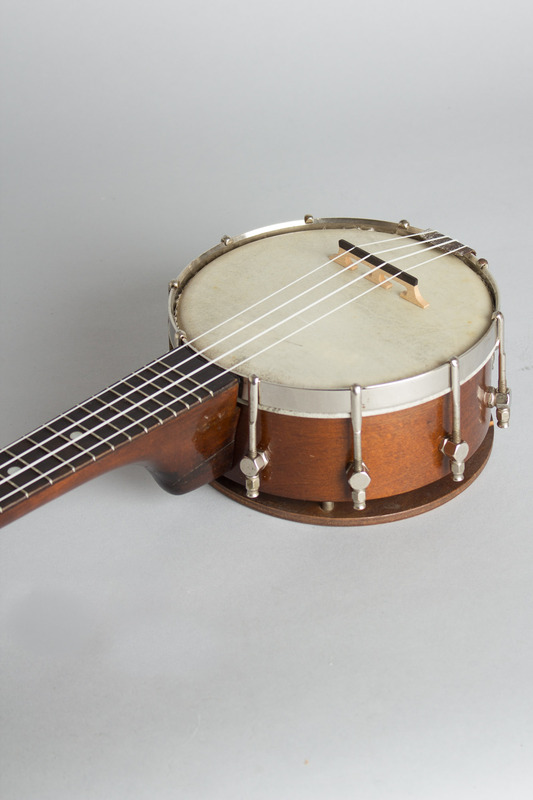 There is an old heel repair by the lower lag bolt that is solid but noticeable; it's unusual for this instrument but hasn't hurt function anyway. 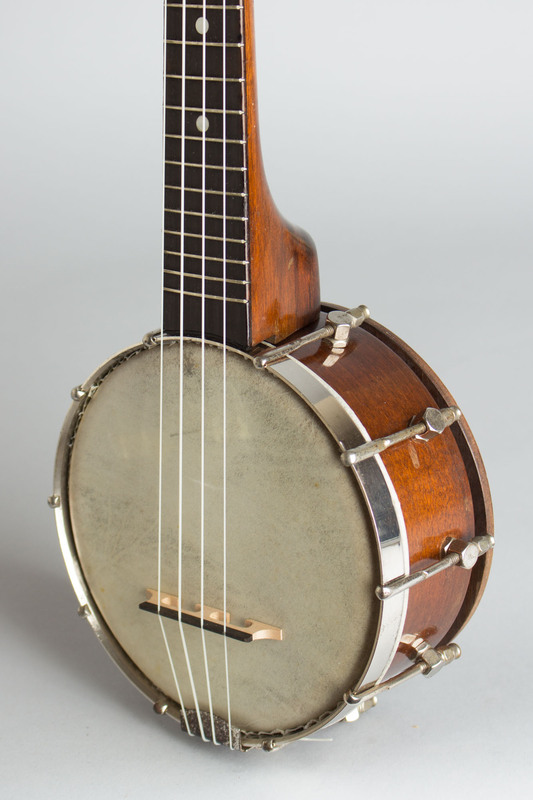 All else is complete and original except two of the screws holding on the resonator plate; the plating on the tailpiece has a lot of corrosion but most of the rest is relatively clean. 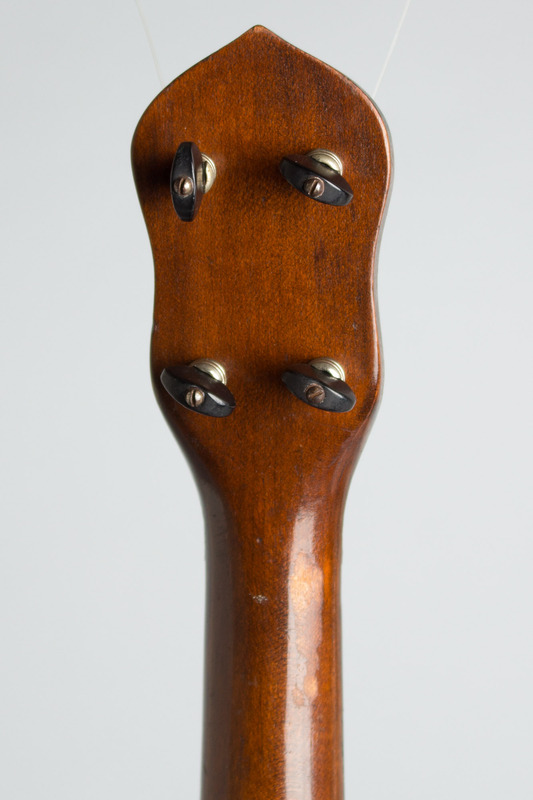 There is some general finish wear, the only large spot is some thumbwear into the wood a bit on the back of the neck. 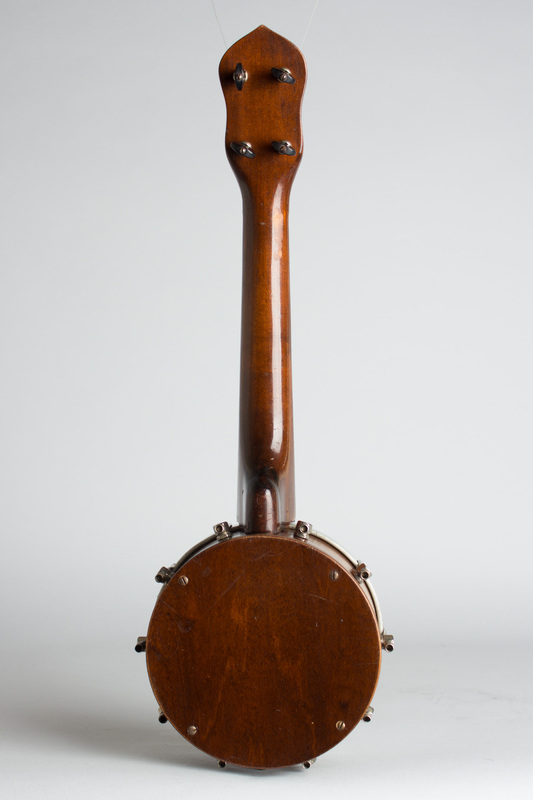 A fine player with the patented "78RPM" sound in spades, housed in a period slightly oversized case that looks like it would also hold a very large revolver. Very Good + Condition.